United States President, Barack Obama, lays a wreath in the Hall of Remembrance at Yad Vashem in memory of the six million Jews murdered in the Holocaust. 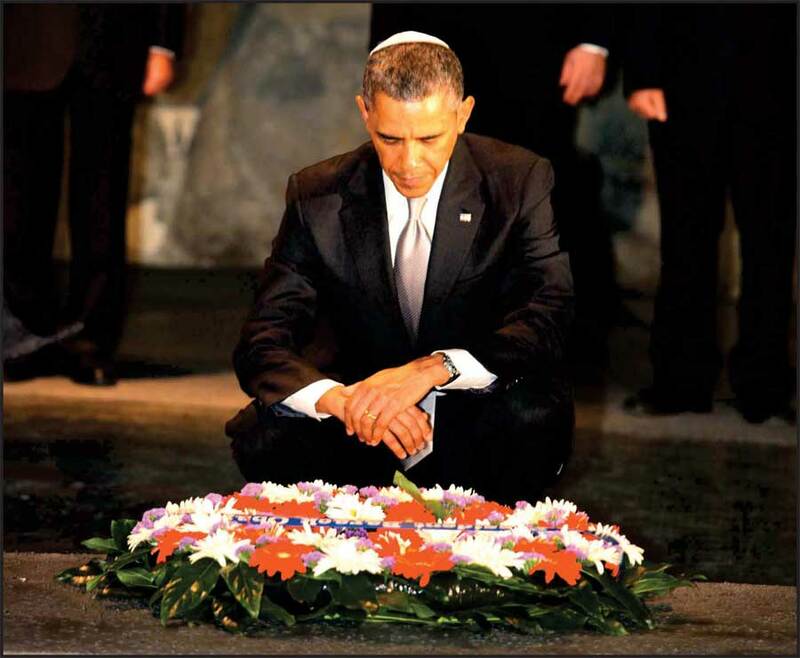 At the end of his historic visit to Israel, US President Barack Obama visited Yad Vashem. He visited the Hall of Names, the Museum of Holocaust Art, participated in a memorial ceremony in the Hall of Remembrance, and visited the Children�s Memorial, before signing the Yad Vashem Guest Book. President Obama was accompanied by President Shimon Peres, Prime Minister Benjamin Netanyahu, Chairman of the Yad Vashem Directorate Avner Shalev and Chairman of the Yad Vashem Council Rabbi Israel Meir Lau. In remarks at the conclusion of the visit, President Obama said, �And to them I will give my house and with my walls a memorial and a name, an everlasting name that shall not be cut off. �President Peres, Prime Minister Netanyahu, Chairman Shalev, Rabbi Lau, thank you for sharing this house, this memorial with me today. Thank you the people of Israel for preserving the names of the millions taken from us, of blessed memory, names that shall never be forgotten. This is my second visit to this living memorial. Since then I've walked among the barbed wire, the guard towers, of Buchenwald. Rabbi Lau told me of his time there, and we reminisced about our good friend Eli Wiesel and the memories that he shared with me. I've stood in the old Warsaw Ghetto with survivors who would not go quietly. �But nothing equals the wrenching power of this sacred place where the totality of the Shoah is told. We could come here a thousand times and each time our hearts would break. For here we see the depravity to which man can sink, the barbarism that unfolds when we begin to see our fellow human beings as somehow less than us, less worthy of dignity, and of life. We see how evil can for a moment in time triumph; when good people do nothing, how silence abetting a crime unique in human history. �Here we see their faces and we hear their voices. We look upon the objects of their lives, the art that they created, the prayer books that they carried. �We see that even as they had hate etched into their arms, they were not numbers, they were men, and women and children, so many children, sent to their deaths because of who they were, how they prayed or who they loved. And yet here alongside man's capacity for evil we also are reminded of man's capacity for good. �The rescuers, the Righteous Among Nations who refused to be bystanders, and in their noble acts of courage, we see how this place, this accounting of horror, is in the end a source of hope, for here we learn that we are never powerless, in our lives we always have choices. To succumb to our worst instincts, or to summon the better angels of our nature, to be indifferent to suffering wherever it may be, whoever it may be visited upon, or to display empathy that is at the core of our humanity, we have a choice to acquiesce to evil or to make real our solemn vow never again. We have a choice to ignore what happens to others or to act on behalf of others and to continually examine in ourselves, whatever dark places there may be that might lead to such actions or inactions. This is our obligation, not simply to bear witness, but to act. �For us in our time, this means confronting bigotry and hatred in all its forms, racism, especially antisemitism. None of that has a place in the civilized world, not in the classrooms of children, not in the corridors of power, and let us never forget the link between the two. For our sons and daughters are not born to hate. They are taught to hate. So let us fill their young hearts with the same understanding and compassion that we hope others have for them. �Here we hope, because after we walk through these halls, after you pass through the darkness there is light. The glorious view of the Jerusalem forest, with the sun shining over the historic homeland of the Jewish people, a fulfillment of the prophecy: You shall live again, upon your own soil. Here on your ancient land let it be said for all the world to hear, the State of Israel does not exist because of the Holocaust, but with the survival of a strong Jewish State of Israel such a Holocaust will never happen again. �That's a reminder of who we can be. But, we have to work for it. We have to work for it here in Israel, we have to work for it in America, we have to work for it around the world. To tend the light and the brightness as opposed to our worst instincts. May God bless the memory of the millions. May their souls be bound up in the bound of eternal life, and may each spring bring a full bloom even more beautiful than the last."